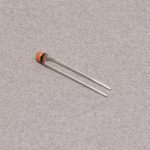 This non-contact temperature sensor is designed to measure the temperature of an object by bouncing infrared light off of it. 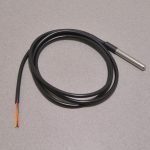 Because of this, the sensor can measure a very wide temperature range (-70°C to +380°C) with ±0.5°C accuracy! The sensor has a 90 degree field of view and provides an “average” temperature of the area visible. 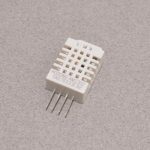 The MLX90615 is connected by I2C and includes a couple of 10K pull up resistors for the data lines. 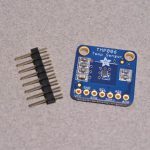 The sensor is breadboard compatible or can be soldered into more permanent projects. 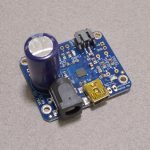 There are four pins to connect: I2C Clock, I2C Data, Power (5VDC) and Ground. this is the 5V version of the sensor; the sensor pinout is included in the datasheet linked below. SKU: SEN-027. Category: Temperature. Tags: Adafruit, Light Packet, Sensor, Temperature.